Some call this soup Jewish penicillin, others just say this homemade chicken soup busts through cold and flu season. I just call it delicious. This is the homemade chicken soup from scratch recipe I grew up enjoying. 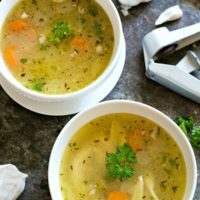 If you love chicken soup as much as we do, you will want to check out all of my delicious homemade chicken soup recipes! Do you love homemade chicken soup? For some reason, I only make this soup when someone is sick. This soup is as close to comfort food as it gets. I remember my grandmother making this soup every time we went to visit. The memories come back every time I make this soup. This chicken soup recipe takes time to make…but I promise it is worth it! You can also make the Instant Pot Version of this Homemade Chicken Soup! Delicious flavor in a fraction of the time!! This soup is as close to comfort food as it gets. I remember my grandmother making this soup every time we went to visit. The memories come back every time I make this soup. This chicken soup takes time to make…but I promise it is worth it! It is so easy to make a bowl of good chicken soup from scratch. You don’t need many ingredients. Just add chicken, carrots, onion, garlic, and celery to a pot. You can add noodles to make chicken noodle soup, or add rice. We usually make chicken and rice soup because gluten free noodles tend to get pretty mushy. You can use brown or white rice in this soup recipe. This soup is Whole 30, Paleo, Keto, and Gluten Free. Perfect for anyone who has food allergies. 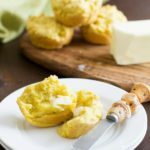 Pair this soup with these delicious gluten free bread for easy dipping: Gluten Free Light and Fluffy Cheddar Muffins or this Gluten Free Focaccia Bread. I prefer to use an organic whole chicken. Include the neck and organs…it all goes into the pot. You will want to cook this down for a couple of hours so the chicken flavor is infused into the broth. Classic chicken soup has onion, carrot, and celery. I have added turnip and rutabaga to my chicken soup recipe over the years, but for this post, I wanted to keep it close to my grandma’s recipe. (If you decide to add other vegetables, you would want one small turnip and one small rutabaga chopped up.) You can also try this easy Instant Pot Vegetable Soup with Chicken for a soup with lots of extra vegetables. I used dried thyme and dried basil. I did use fresh garlic cloves because dried garlic powder just doesn’t add the same flavors to the soup broth. Fresh parsley is also better to use. Add your raw whole chicken to a stock pot. Add in low sodium chicken broth, seasonings, vegetables, and water. Cover and bring the chicken soup to a boil. Turn down the heat and allow this chicken soup to simmer for two hours. Cover and bring the chicken soup to a boil. Turn down the heat and allow this chicken soup to simmer for two hours. After the chicken cooks in the soup for 2 hours, remove it to a separate pan so the bones don’t all fall apart in the soup. You can read tons of reviews on this soup via Pinterest. A big soup pot that is large enough to hold a whole chicken. A vegetable chopper to chop up your vegetables. An easy homemade chicken soup made from scratch. Grandma's chicken soup recipe is easy to make using a whole chicken and vegetables. Add a whole raw chicken to a large stock pot. Add all ingredients, cover and simmer on medium low until it boils. Once the soup is boiling, turn down the temperature to low and simmer for 2 hours. Remove the chicken to a pan. Do this carefully so the chicken doesn't fall apart. Cut the chicken meat into pieces and add back to the soup. Garnish with fresh parsley if you like. 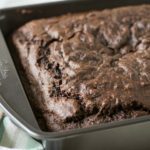 More Gluten Free Recipes To Try! Second time I am making this soup – BEST recipe ever – full of flavor Thank You !! Yay!! I am so glad you liked my grandmother’s soup, Kathy. I appreciate your coming back to let me know. If you didn’t leave a star rating in the recipe card by clicking the stars, I would be so grateful if you would so people know how yummy this recipe is. Thank you for this recipe. We are making it right now and it smells wonderful. I am so glad you are trying this. Let me know how it turns out. Thanks so much for a delicious recipe…Yum!! I am so glad Marie…I hope you feel better soon :-). Yessssss!! This soup is just what the doctor calls for when sick! I made this yesterday for me and the little woman. I am sick as a dog, so I looked up soups on Pinterest. I came up with this gem! Easy to make, very flavorful and inexpensive. I am adding this to my favorites, for sure! I am so glad you liked my Grandma’s recipe Al! Thank you so much for coming to let us know :-). I was all set to come on here and tell you that a soup is NOT homemade if you buy the broth, then saw that yours calls for the whole chidken–this truly is Gramma’s recipe, except that she used the feet whenever possible. If I want to refrigerate this and eat it throughout the week, should I skim some of the fat off the top? Or would that take away the delicious flavor? Thank you for sharing! In the middle of a bad cold and made this today. This definitely hit the spot. Thanks for sharing! I am so glad it helped Cindy. I hope you feel better soon :-). I am sooo glad you liked this Wendy. Thank you for coming back to let me know! My soup is on the stove top as we speak! The whole house is filled with such an amazing aroma. Can not wait to take this to work this week! Thanks for sharing such a great recipe. I am so glad you are trying my grandmother’s recipe. Enjoy :-). I am so glad you like it, Kirsten. I hope your husband and son feel better soon :-). Best flavor of any chicken soup I’ve ever made! My husband loved it too! A definite keeper and go-to for cold winter days in Wisconsin! I am so glad you and your husband like this soup…my grandmother would be so excited that so many can enjoy it. I also appreciate your coming back to let me know it was a hit :-). No colds or flu yet…this is a trial run, I just made this soup , grated a few potatoes into it as well. Still tastes awesome. This is on the stove as I “speak”. Curious, the liquids did not cover the chicken (a small B&E young chicken). Not sure if that’s a problem??? Also, adding the carrots and celery halfway through, as I am hoping they will not be that mushy. Will be serving with an egg noodle, or pasta. Hi Karen, I am so glad you are trying this recipe. I would say add more water unless you are using a giant pot with a small chicken? You can always salt a little more. I have started to add a scoop of chicken collagen protein powder (by Vital Proteins) lately as well for a boost. Followed recipe as posted. Added corn and white potatoes. Recipe is keeper, looking forward to tomorrow’s lunch. This soup looks soooo delicious, Grandma’s recipes are always the BEST! Certainly my kinda meal and I don’t think I’d be waiting for a sick one before making it, YUM! I also have that issue where I only make chicken soup when’s someone’s sick! Why though?? It’s so good and this one sounds spectacular! 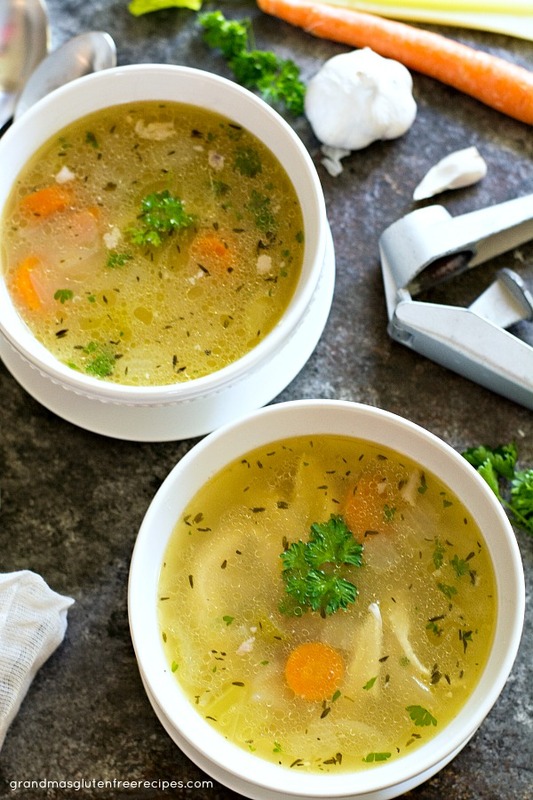 Love this homemade chicken soup and the fact that it’s so good for a cold or flu. I will be sure to come back to this recipe when flu season strikes! Yum! You know when a grandma is involved in the recipe, it’s legit. This looks perfect for knocking out any flu or cold this season! Yum! This sounds like my kind of comfort meal! Will be adding this to my weekly meal plan! I hope you enjoy it as much as we do Kim :-). Chicken soup is the best thing to have when you need a pick me up. This sound so full of flavour. Wait until you try it…a lot of people commented on Pinterest about the wonderful flavors too :-). Hi! I was wondering at what temperature, med-low or med-high or high to cooks the chicken and the soup in before I turn to low and simmer? Making witching the next hour! As soon as I saw a chicken soup recipe with the word “Grandma” in the title, I knew I had to make it! I added a can of Cream of Chicken soup, since I like a thicker broth. I used rotisserie chicken and frozen homemade noodles, and it is the best chicken soup recipe I have ever found. I usually eat one bowl, and give the rest away, but not this time! I froze the remainder for myself! Wow Fern, you are really creative :-). Thank you so much for writing about this soup. I am not sure if you are gluten free or not, but for anyone reading this comment, I do want to point out that Cream of Chicken Soup isn’t gluten free. I do believe Walmart makes a gluten free cream of chicken soup, so just read labels if in doubt. Have a wonderful week. This is my kind of chicken soup! I love that you use the whole chicken! Perfect homemade comfort food recipe – one I’ll definitely be adding to my collection! Can I possibly get the nutrition values (need it for Keto Diet). Can’t wait to try this. Hi Lorrie, I am happy to add it. Do you think cooking in a crockpot all day would do it justice? Hi Terri, I haven’t made it in a crockpot, but I am sure it would work. Will you please stop back and let us know how it turns out? Hi there!! I made this yesterday in my crockpot and it was AMAAAAZING! Cooked on high about 6 hours….lifted out the chicken onto a sheet pan….deboned and put the chicken right back in. Will eat the leftovers today!!!! Oh my gosh Terri, thank you so much for coming back to let us know!! That sounds delicious! It will make the soup beautifully creamy! I want to add alphabet pasta for the kids…when should I add it in?? I think I’m gonna try this, but since I have a bunch of boneless skinless chicken breasts, I’m gonna use them instead. I know I will be sacrificing some of the flavor from the whole chicken, but I think it’s still going to be delicious. Actually you can use already made broth, I use organic bone broth. Hi Suz, I am happy to clarify. I used parsley as a garnish. It is optional, but will add that in. Have a great weekend. Maybe I missed it but when do you add the noodles? how mug parsley do you add and do you add the chicken back in? We are big fans of homemade chicken soup here. It is definitely the perfect food for a cold! And this looks like a great and easy recipe.